Coffee was introduced throughout the islands of Indonesia by the Dutch in the 1600s, and was first exported by the Dutch East India Company in the early 1700s. Large Dutch-owned plantations were the norm, and the laborers and locals suffered financially and politically under the colonial regime: The 1860 novel Max Havelaar: Or the Coffee Auctions of the Dutch Trading Company outlined many of the ways that the Dutch government and landowners abused and oppressed the Indonesian people, specifically on Sumatra and Java. Poverty, starvation, and destitution were common among coffee workers and within the indigenous communities. In the 1860s and 1870s, a coffee-leaf-rust epidemic decimated the coffee market in Indonesia, and led to the abandonment of many estates by the Dutch; as the plantations broke up, laborers took up small plots of the land, eventually replanting most of the old-stock Arabica with Robusta coffee and various more disease-resistant hybrids. This land redistribution created the predominance of smallholder growers on the islands, which exists to this day. Taken as a whole, Indonesia is the fourth-largest coffee-producing country in the world. Sumatran coffees have long been distinct for their earthy, savory, somewhat vegetal or herbaceous characteristics, in part contributed by the climate and the mix of varieties grown, but also due to a specific post-harvest processing style called Wet-Hulling, or locally known as Giling Basah, which imparts much of the unique qualities these coffees have. Before the 1970s, coffees in Sumatra were processed in the two most commonly found methods worldwide: washed and natural. In the 1970s, Japanese interest in Sumatran coffees led to the introduction of the Wet-Hulled process, a unique style of handling and drying that is largely responsible for Sumatran coffees’ unmistakable flavor characteristics, but also their normally greenish-blue hue. In Sumatra, coffee farmers will typically harvest their coffee cherry and depulp it by hand at their farm or home, allow it to dry for a very short time, then bring it either to a coffee marketplace or directly to a “collector,” or collection point, where the beans are purchased at anywhere from 30–50% moisture, with their mucilage still partially intact. The coffee is then combined and hulled (has its parchment removed) while it is still in this high-moisture state. The coffee is then dried to the more commonly globally accepted 11–13% moisture in order to prepare for export. While there is some experimentation currently being done with large-scale Washed coffee for export—currently much of the Washed coffee produced is for local consumption—the Wet-Hulled process was developed specifically to speed up drying and efficiency in a climate that sees heavy rain and clouds most of the year: Removing the parchment layer allows the coffee to dry much faster on patios or tarps even in these conditions. 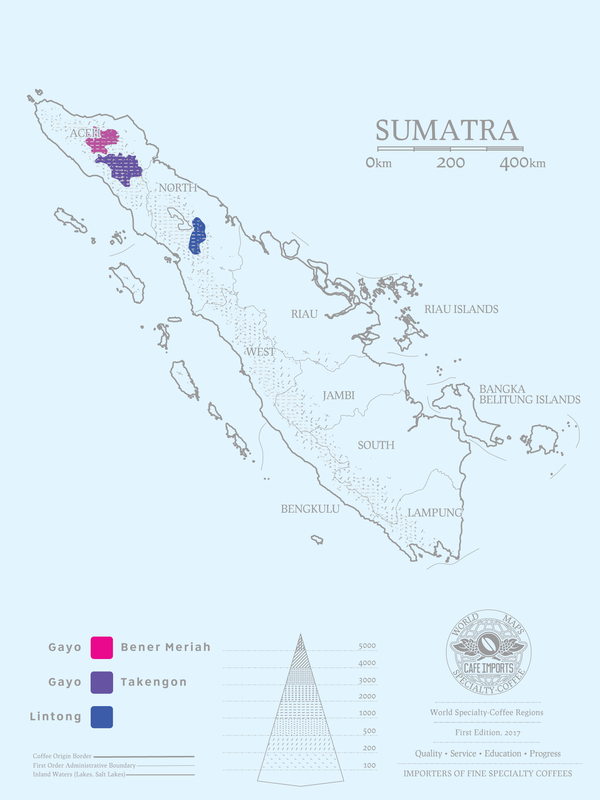 Sumatra is a fascinating origin, unique even among its fellow Indonesian coffee-growing islands and areas. The vast diversity that we have found there is one of the exciting reasons that we are always happy to go back, and to face cupping after cupping after cupping of Sumatran coffee in search of something special. Through this rigorous process we have discovered producers and developed long-term partnerships with both individual farmer/collectors and cooperatives of various smallholders. We are also able to work with these partners to request (and pay more) more selective picking and processing, and we have undertaken several experiments with special-prep Wet-Hulling, to varying degrees of success. We continue to pursue more and more special microlots and alternative processing methods, and we feel that there is a lot of untapped potential in this powerhouse producing region: Washed coffees in particular have grabbed our attention and our palates, as has the increase in democratically organized associations of women coffee producers. Cafe Imports will continue to be on the ground in Sumatra, as senior green-coffee buyer Piero Cristiani nurtures the partnerships he has worked to establish there, and he continues to seek the best and brightest (and cleanest cups) that Sumatra has to offer.